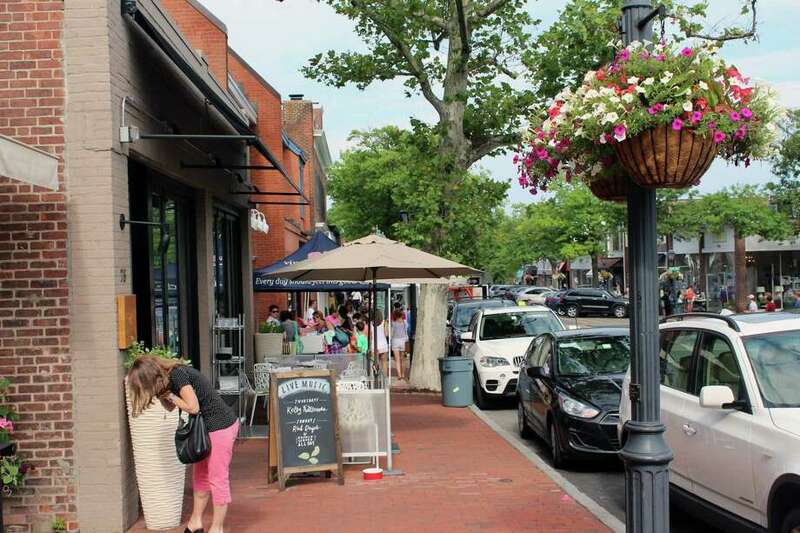 Shoppers converge on Downtown New Canaan for the Sidewalk Sale on July 15, 2016. NEW CANAAN — It’s going to be a free-for-all for people parking in downtown once the fresh paint of the new parking layout dries up on Elm Street. After half a century of not abiding by a state statute that disallows vehicles from parking 25 feet from a crosswalk or intersection, a citizen notified the town it was breaking the law. “We’ve been put on notice that it’s a law by a citizen,” Police Deputy Chief John DiFederico said at the Police Commission meeting last Wednesday. Reconfiguring parking downtown to abide by the 1949 state law will come at the cost of 15 parking spots. DiFederico explained the law prevents cars from backing into the crosswalk and endangering pedestrians, and that handicap spots were not exempt from the statute. DiFederico declined to name the citizen who put the town on notice when asked by reporters at the meeting. The three Police Commission members — Chairman Sperry DeCew, Secretary Paul Foley and James McLaughlin — lamented the loss of parking spaces downtown. When the commissioners asked if there was any way around the statute or if a waiver could be possible, DiFederico said the Frederick P. Clarke Associates’ consultant hired by the town earlier this month by the town to review this issue had spoken with the Department of Transportation and was told the town needed to abide by state law. “It is what it is,” DiFederico said. The commission, with no other recourse, unanimously voted to authorize the redrawing of parking spots in downtown. Director of Public Works Tiger Mann said the department was planning to overlay Elm Street this week if the weather was favorable. “The material needs to cure for at least a week before restriping,” Mann said via email Tuesday.